Prairie View is a dangerous offense that can hurt you with RPOs, drop back passing or broken plays. We got gifs. The Prairie View offense has been on a gone through defenses all year like a hot knife through butter. The Panthers are rolling up 473 yards per game, 33.5 points per game, they average 214 yards on the ground per game and 259 yards per game through the air. Quarterback Jalen Morton leads the conference in passing yards and passing touchdowns while only throwing two interceptions all year. Junior running back Dawonya Tucker has been amazing all season. Tucker may be small in stature but his game is anything but! Tucker leads the nation with 795 yards rushing, he averages 8.4 yards per carry, 132.5 yards per game and has scored four rushing touchdowns this year. The Prairie View offense has gone over 300 total yards in every game this year outside of their trip out west to face off against FBS UNLV which held the Panthers to a season-low 278 total yards. Remarkably the Panthers aren’t the pass-happy team that they’ve been in the past under Willie Simmons. This edition of the Prairie View offense is extremely balanced with 202 passing attempts on the year and 229 rushing attempts. It’s the balance between the run and the pass that makes Prairie View so difficult to stop. The ability to strike by air or on the ground has caused nightmares for defensive coordinators. Multiple formations with multiple options: Typically the Panthers will line up in four wide and a single back, but they use motion from the slot receivers to the up the read option. This allows Jalen Morton to quickly read the defense while deciding to keep the ball himself for an outside run or hand of on the dive to Dewonya Tucker. On this particular play, Morton hands off to Tucker for a huge gain. -The Panthers will use this formation to fake the dive to Tucker and roll Morton out to the motion side for a sprint out pass. On this particular play Morton rolls out to hit tight end Jose Medrano for a nice gain. The vision of running Tucker: Add in the creative offensive mind of head coach Eric Dooley and offensive coordinator Ted White, and PVAMU is just a big headache: On this particular play the Panthers line up with trips to the left side of the formation and a single receiver to the right. This run is designed to go away from the strong side due to the defense shifting to the strong side. Morton hands of to Tucker and he goes untouched for a touchdown. Duh, it’s Tucker: Tucker doesn’t need much room to break big yards. Tucker is the nation’s leading rusher and stopping Tucker is key to slowing down the offense. UNLV limited Prairie View to 278 yards total and only 40 yards on the ground. This offense becomes easier to defend if you can stop the run game which make the Run/Pass options (RPOs) less effective. Jalen Morton is more athletic than people give him credit for and can hurt you on broken down plays: Morton has added 484 yards on the ground this year from the quarterback position. On this particular play the defense calls a blitz which is successful but Morton shows the athletic ability to beat the blitz and convert a 3rd and long. So how do you contain this explosive offense? Pressure Morton and don’t miss tackles once you get to him on passing downs: Prairie View’s offensive line isn’t the most talented bunch which is why most of their plays come off of out scheming the defense. On this particular play the defensive line runs a “twist” to get to Morton and they wrap him up to avoid a long run off of a quarterback scramble. 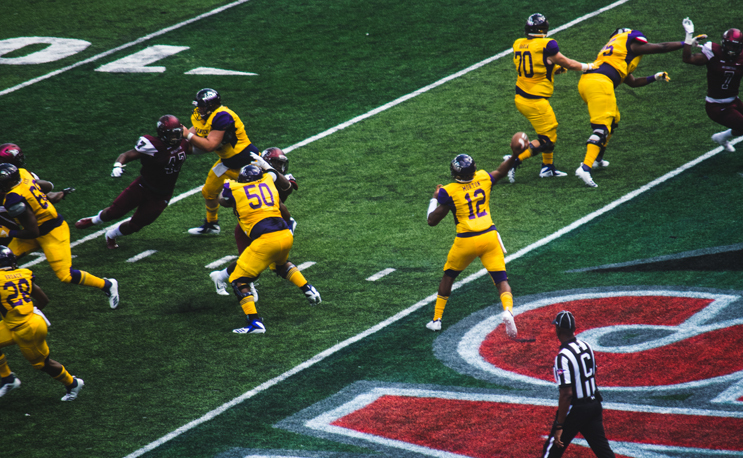 Play assignment football defensively: Prairie View takes advantage of blown assignments by defenses and usually converts defensive mistakes into big yardage. This includes the defending the RPOs. As you can see on this play the defense played assignment football which to away the run option and the pass option was well defended. Win the line of scrimmage but play under control: This is key in order to eliminate the cutback lanes for Tucker. When defensive line sacrifice “gap integrity” it leaves huge holes that a back like Tucker will find and explode through. But on this play the defensive line plays under control and is able to stop Tucker for a loss. Be physical and avoid missed tackles: Prairie View has broken big plays due to missed tackles all year. It is very important to eliminate yards after contact and yards after the catch. Make this offense earn EVERYTHING! This team is good enough without having to get any assistance from the defense through missed tackles and blown assignments.